Are you concerned about oral hygiene and Find it challenging to brush your little one's teeth and gum? Get everything you need to maintain your little one's oral hygiene with Royal Angels Baby Toothbrush & Holder, designed for babies, infant, toddler, or children with all ages. -Wide Oval Ring Shaped handle and short neck prevents choking and swallowing. Ring Handle design also make it easy for small hands to have better grip and handling. -Teething pads on handle acts as teething ring, allows chewing relief for baby's sore and irritated gum. -Extra soft bristles with blue colored indicator shows you how much baby toothpaste to be used. 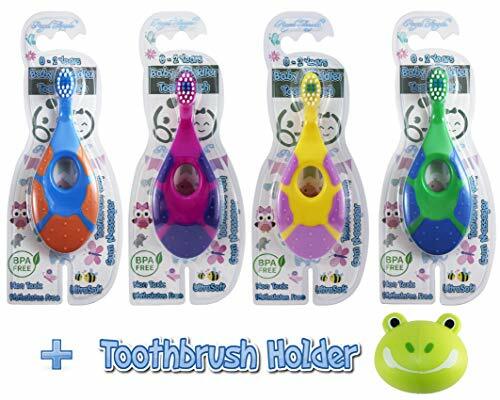 -BONUS frog animal air vented toothbrush holder allows storage of toothbrush dry, protected from dust and harmful bacterial. With its suction cups, it is easy to mount on glass, mirror, and tiles. It is also super easy to wash and clean. -100% non-toxic, BPA and Phthalates Free material that is durable. All Royal Angels Products comes with a full refund for any reason you are not satisfied. Choose Royal Angels Baby Toothbrush & Holder NOW and start Brushing with FUN!! !